Perhaps the finest artifact we have in the museum collection is the pair of moccasins that we have featured in this current article. They came to us through the generosity of Dave Conte who got them from a collection in northern California. That is where the information ends and the mystery begins. The soles, unfortunately, are replacements done fairly recently so the shape of the original rawhide soles is lost and with it any clues of tribal characteristics that are found in sole outlines. The general cut of the moccasin is Plains Indian, but these are many: Sioux, Cheyenne, Kiowa, Commanche, Pawnee, Oto, Arapaho, Crow, Bannock, Shoshone, Ute, etc., just to mention a few. The cut of the tongue is like a number of Sioux mocs I have seen, but not all Sioux have this cut and it is not Sioux exclusively. Also, they do not have the "buffalo hoof-print" pattern on the top that most Sioux fully beaded moccasins have. The yellow background is quite distinctive. Southern Plains Indians like to rub yellow pigments into buckskin as a background color on shirts, bags, and other such items, but these mocs do not have the fringed back seam or fringes down the instep to the toe as do the Kiowa and Commanche mocs. Our moccasins were shown to our two finest consultants at the time of our 1982 Cody gathering. Bob Edgar of Old Trail Town, artist, ethnologist, and consultant to the great Cody Museum studied them as did Clyde Hall, a Shoshone, Tribal Judge, Curator, Museologist, and super ethnologist, along with some of their associates present. The conclusions were unanimous! Cheyenne . . . or Arapaho. Both these tribes living neighbors to each other in the Wyoming/Colorado area had many common characteristics, but the yellow beads . . . Arapaho! These were the people that used yellow as a preferred background color. All the beads are Venetican glass, size 11 by current standards, and all beads are the colors that were common in the last century but have not (with the exception of the transparent cobalt-blue) been made in this century. The background is the well-known but very scarce and expensive greasy yellows. The red is a red white-heart (not the rose red white-heart, but the common brighter red). The trader blue is that milky, greasy, semi-translucent light blue that was so common during the eighteenth and nineteenth centuries but is so scarce and costly now. The squares on the toe of the moccasins are of blue beads whose color I have never seen or heard described before (that means nothing), but have seen on some fine old pieces (another phrase that really doesn't mean anything). These beads are a transparent thalo blue (check this out with a tube of oil paints of this color if you are that serious in your research). It is not as dark as the cobalt blues, but very rich in color. All stitching with the exception of the replacement soles has been done with sinue and is, of course, on brain tanned leather that is thick enough to be elk rather than deer, while lacking the softness of elk they feel more like buffalo calf. The beaded rows on the bands are done with eight beads per row as was common with the Sioux rather than seven or nine as was more common with such as the Shoshone. But in the toe area the rows contain ten up to fifteen beads on a single strand. This large number of beads lays down comparatively flat on this piece because it is done with sinew. These long strands look a bit loose and sloppy when we try to duplicate them today substituting Nymo for sinew. 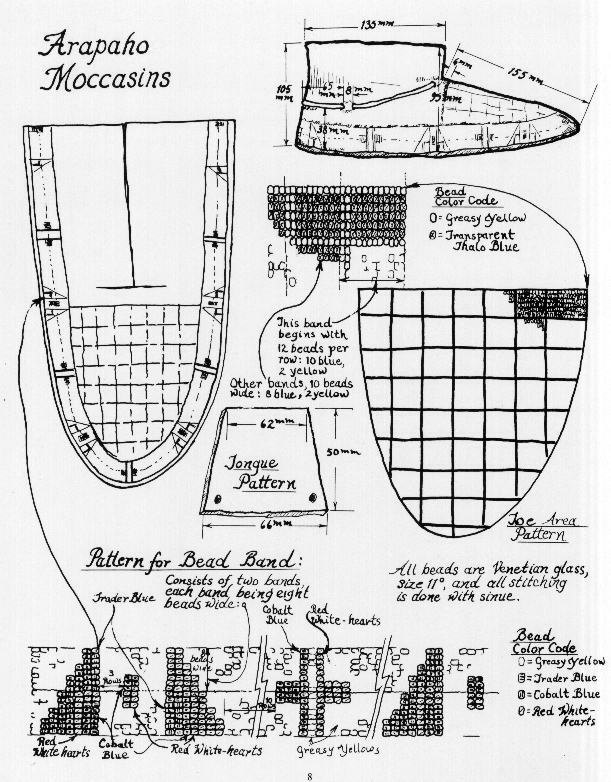 Hopefully no one will ever copy these moccasins exactly as the pattern belongs to the original maker, but the style and color combinations are there for you as an aid when you create your own authentic-to-the-period moccasins or perhaps even adapt these to a pouch or other item you need. These mocassins probably date to circa 1900.